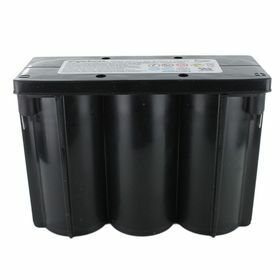 Enersys Hawker Cyclon 6V 8Ah Battery 0859-0012 from County Battery Services. The Cyclon series Rechargeable Battery has a longer service life, fewer replacements and combined with higher reliability. It has 50PSI safety valve which lets gases escape, then automatically reseals, so there's no risk of excessive gas accumulation within the battery or dry out failure from repeated recharges. It is made from 99.99% pure lead, CYCLON battery plates are extremely thin, so they offer more surface area then conventional batteries and far more power. High purity acid is absorbed right into the Absorbed Glass Mat (AGM) plate separators, so the CYCLON battery provides leak-proof operation in any position. The CYCLON battery's metal outer jacket offers extreme shock, vibration, temperature and flammability protection. Suitable for Applications like Power Management.